Analysis: How will the decision affect Arsenal's season? The Football Association has suspended four Arsenal players and handed out fines totalling £275,000 in one of the biggest crackdowns in English club football. Arsenal received a record fine of £175,000 for failing to control their players in the controversial goalless draw against Manchester United on 21 September. Lauren, Martin Keown, Ashley Cole, Ray Parlour and Patrick Vieira were all also fined after pleading guilty to improper conduct. Vieira was sent-off for two yellow cards during the game while the other four were involved in the ugly scenes after the final whistle. The club apologised for the conduct of it players but said it was "considering its position" as far as the penalties imposed were concerned. Lauren has received the most severe punishment and been suspended for four games as well as being fined £40,000. An FA statement read that Lauren was guilty of "violent behaviour in forcibly pushing Van Nistelrooy in the back following the final whistle. "And for improper conduct in confronting Van Nistelrooy after Patrick Vieira's sending-off and kicking out at Quinton Fortune following the penalty award." 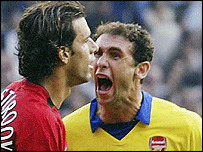 Keown has been suspended for three games and been fined £20,000 "for violent behaviour in his actions towards Ruud van Nistelrooy." Vieira and Parlour will both miss one game each for their offences with the Frenchman picking up a £20,000 fine and the English midfielder fined £10,000. Vieira's reprimand comes "for improper conduct in failing to leave the field of play following his sending-off". Parlour was guilty "for his improper conduct in separate confrontations with Ruud van Nistelrooy and Gary Neville after the final whistle". Cole has been warned as to his future conduct by the FA and fined £10,000 for his part in the confrontation which saw him involved in an incident with Cristiano Ronaldo. Manchester United's Ronaldo and Ryan Giggs have also been charged with improper conduct by the FA but they will contest their charges at a later date. The Gunners keeper Jens Lehmann was also hit with a improper conduct charge which was later dropped. Arsenal's fine was the largest handed out by the FA in English football history. Previous highs included £100,000 for both Boston and Chesterfield, but that was over financial irregularities rather than ill-discipline. New FA chief executive Mark Palios pledged to get tough with clubs and players after taking over his new job earlier this year. The suspensions for the Highbury club's players will start on Monday, 17 November. Lauren will miss the Premiership matches against Birmingham, Leicester, Fulham and the Carling Cup clash with Wolves. Keown will miss the above games with the exception of the Leicester match. Vieira and Parlour will serve their suspensions when Arsenal are at St Andrews on 22 November. Arsenal now have 14 days to appeal. "The fine is a record for a single club"